Need some ideas for keeping the hydrangea theme going with sweets for parties and the wedding reception? 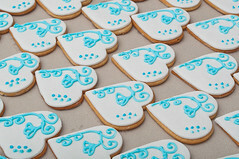 The bridal shower and wedding reception can easily keep the hydrangea theme with pretty decorated cookies. Flowers are beautiful and intricate in nature and sometimes a bit difficult to copy when preparing food, but I’ve found a few simple ways to do so for the do-it-yourself party planner or for ordering already made. A nice idea I came across for using hydrangeas for the reception would be to decorate a shaped cookie of any kind with icing and add a simple little flower to the corner and write a guests name in the center to use as place holders. You could even add the table number to the cookie if you wanted. As far as ordering online, I had a tough time finding a place that advertised blue hydrangea cookies, but the site Maine Cakes and Cookies has a lot of cookies for all types of events – (sports, animals, state shapes, sea life, etc), and the site does have contact information and asks that you DO make special requests. Also the fun site One Tough Cookie is looking for your suggestions as well. Apparently these people can whip up any type of cookie and you just may find the perfect hydrangea designs there. The Cupcakes are a bit easier to find and the ones featured on Confections, Cakes & Creations! blog are so cute. She shows a chocolate cupcake covered with the tiny blue flowers to make up a hydrangea bloom and she even adds the little yellow centers. The “love to know” cake decorating site gives some links to finding fondant hydrangea cutters which will make lots of little flowers at once for adding to your own confections. And if you don’t know much about fondant, check out the Fondant Cake Decorating page which has lots of useful information. I’ll keep my eyes open for more places to buy your wedding confections and will up date with another post here. If you have a site that sells cookies or items related to this post, say so in the comment area and I may add you as a link.